The Antelope Valley Community Concert Association will host its community concert at the Lancaster Performing Arts Center featuring a performance by Golden Bough. 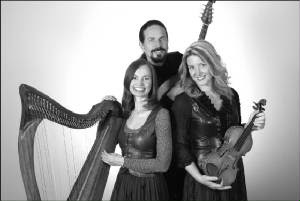 Golden Bough will take the attendees on a musical tour through seven Celtic lands. Join the tour and visit the musical stylings of Ireland, Scotland, Wales, Cornwall, the Isle of Man, French Brittany and the North of Spain (Galicia).The Golden Bough features an assortment of musical instruments including the guitar, harp, violin, ace-fiddle, accordion, penny whistle, and the mandolin. The concert will take place at the LPAC on Tuesday October 27th at 8:00pm.